All Healthcare Ethics and Catholic Healthcare Ethics programs include academic courses and clinical ethics rotations or internships. Students may study full-time or part-time. Part-time students must take a minimum of two courses each fall and spring semester. Typically, courses are taught in the afternoon and evening. The courses are designed with a focus on research competencies. This will better facilitate the writing of dissertations. Congratulations to Dr. Joris Gielen who has been named Director of the Center for Healthcare Ethics in the McAnulty College and Graduate School of Liberal Arts! Please see this article in the DU Times for more information. 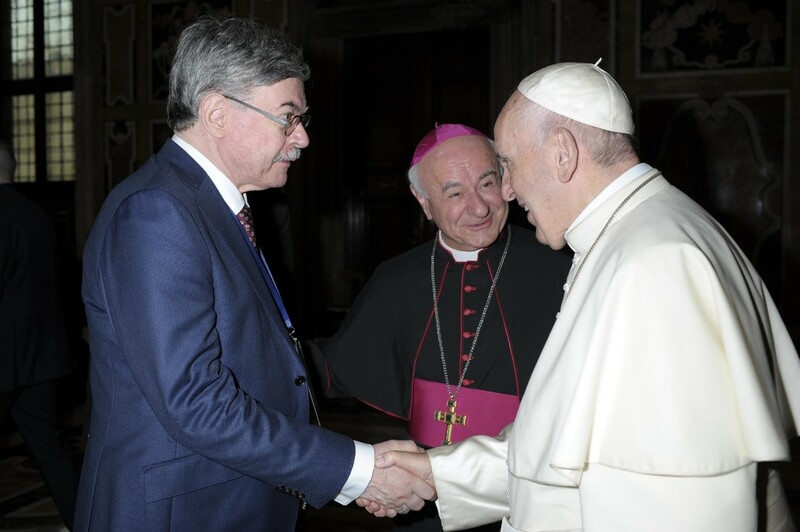 Dr. Henk ten Have meets Pope Francis at the occasion of the annual conference of the Pontifical Academy for Life in Rome, June 2018. In his speech to the Academy, Pope Francis advocated a global vision of bioethics based on "the irrevocable dignity of the human person". The Academy has set up a working group on Global Bioethics under the chairmanship of Dr ten Have. Healthcare ethics is an interdisciplinary field in a globalized context that engages clinical, organizational, professional, and research issues related to medicine, science, law, policy, social science, and the humanities. 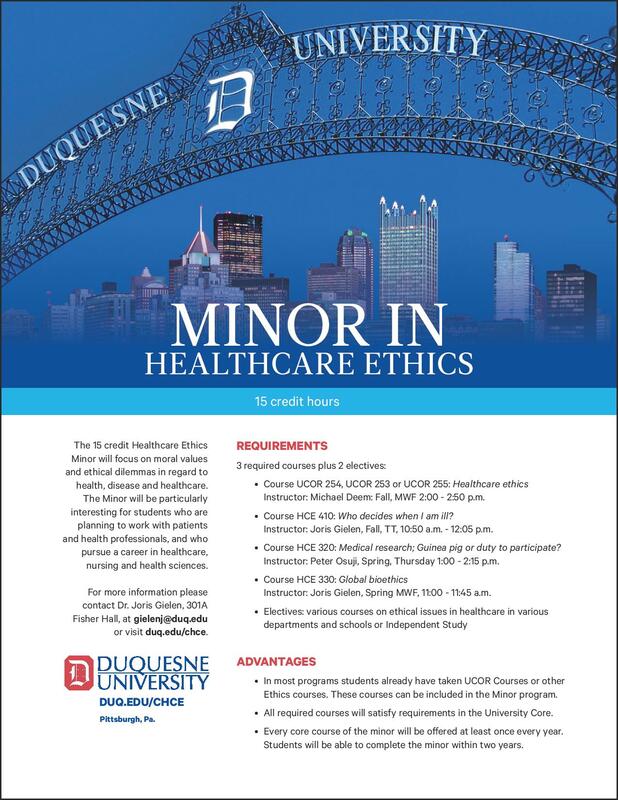 The Center for Healthcare Ethics is part of the McAnulty College and Graduate School of Liberal Arts at Duquesne University, having offered degree programs in healthcare ethics since 1993. The Healthcare Ethics academic program trains scholars and professionals in the field of health care ethics. In addition to academic courses there are clinical ethics rotations and internships that provide Mentored Apprenticeships in Ethics Consultation supervised by our faculty. It also sponsors lecture series, networks and affiliations that bring together thought-leaders in healthcare ethics to work internationally on issues of importance. Candidates for the Master of Arts in Healthcare Ethics are eligible to receive a Master of Arts Scholarship through the Duquesne University McAnulty College and Graduate School that can reduce their degree costs by 25%. For those students enrolling in the Master of Arts in Healthcare Ethics in the Fall 2017 semester, a 25% tutition scholarship is being offered. Please visit the graduate special awards website for specific details.